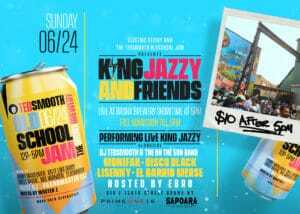 Hosted by Ebro / Electric Sticky & the Ted Smooth, old school jam present King Jazzy and Friends. performing live: trap-ical artist King Jazzy, R&B diva Monifa, latin soul artist LIsenny, el barrio merse, disco black and more. Backed by DJ TEDSMOOTH & the ON THE SUN band. preceded by the Ted Smooth old school jam. FREE entry before 5pm! outdoor/indoor venue/food provided by SAPORA & PRIME 116 security will be tight so no outside alcohol and come free up yourself and enjoy the vibe! !